Christmas movies have been around since... well... practically since movies were invented. We all have our favorites we watch every year. That one (or two... dozen) that brings back feelings of nostalgia and good cheer. There are of course the well-known and popular “It's a Wonderful Life” and “Miracle on 34th Street.” Which, can you believe I've never seen either all the way through? Yes, I know, I was chastised just earlier today over this fact and have added them both to my must watch list this season. Maybe they'll make my top list for next year. For this year, whether your tastes are for chick flicks or action, classics or new twists, there is a little something here for almost everyone on my top ten list. So fix a big Christmas mug full of marshmallow-smothered hot chocolate, grab a holiday bucket of multi-flavored popcorn, and let's go to the movies! 10. Scrooged – There have been no less than seven Hollywood big screen versions, and countless made for TV versions (including various animations) of the Charles Dickens classic “A Christmas Carol”; all of which are heart-warming and enjoyable to watch. 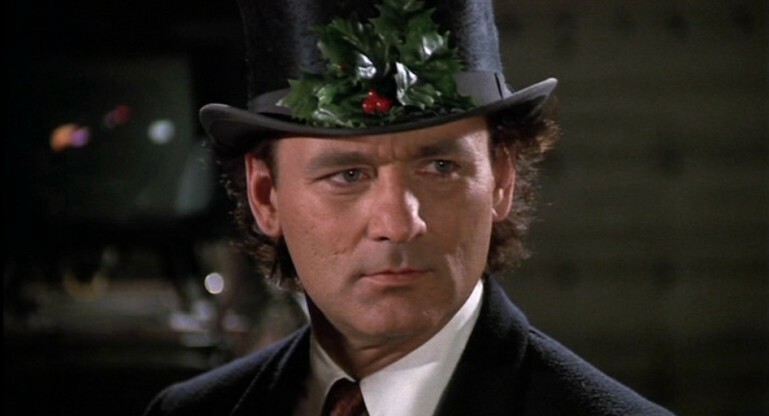 My favorite of them all is the 1988 version “Scrooged” starring Bill Murray. 8. The Preacher's Wife – Who doesn't like Denzel?! And of course there is Whitney Houston too; powerhouse singer and talented actress in her own right. Her voice and energy defined an era in music and young singers still try to emulate her iconic voice. 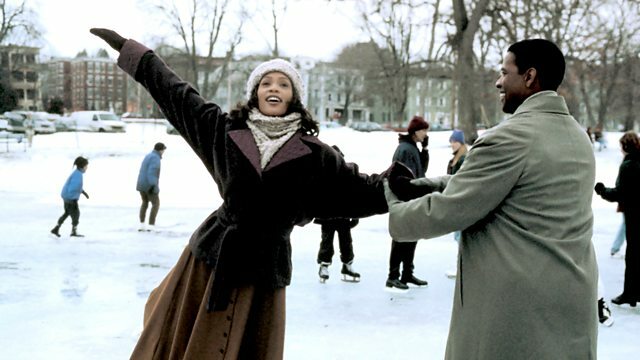 The Preacher's Wife (1996) is about an angel (Denzel Washington) sent down to help a preacher, his wife, their church, and their neighborhood during Christmastime. 7. The Nightmare Before Christmas – This 1993 animation can be described as having a distinctly Burton style. If you've ever seen a Tim Burton film, and who hasn't, you know what I mean. The Nightmare Before Christmas, both an animation and a musical, appeals to kids and adults equally. If you like all things Halloween, love quirky and the macabre, this is the holiday movie for you. Possibly the greatest actor of a generation, Alan Rickman, playing Hans Gruber from Die Hard, the greatest villain of any Christmas movie. 5. Love Actually – FIVE GOLDEN RINGS! Oh, um... sorry about that. Got a little carried away. Anyway, “Love Actually” is a star-studded rom-com that chimes in at number five on my top 10 Christmas movie list. This 2003 Hollywood holiday blockbuster features film greats like Alan Rickman, Liam Neeson, Hugh Grant, Billy Bob Thorton, Colin Firth, Elisha Cuthbert (of 24 fame), and Keira Knightly. Not only is “Love Actually” an enjoyable film following the lives of eight different couples leading up to Christmas, it has a positively FANTASTIC soundtrack, with music to love by both the girls and guys. Love Actually not only makes my top 10 list of Christmas movies, it is also one of the few movies in which I actually like Hugh Grant. 4. Rudolf the Red-Nosed Reindeer – Had a very shiny nose. And if you ever saw... Oh hi! Christmas is that time of year that we all seem to spontaneously break out in Christmas Carols. Or maybe it's just me. Anyway, in 1964 the TV special Rudolf the Red-Nosed Reindeer became an instant holiday classic with its clever stop-motion “Animagic” animation. Even as an adult I still love these nostalgic stop-motion films. And who can resist the heart-warming Isle of Misfit Toys! The stop-motion animation classic, Rudolf the Red-Nosed Reindeer. 3. Babes in Toyland – Originally an operetta, Hollywood has rebooted multiple version of “Babes in Toyland” over the decades. The original started with “March of the Wooden Soldiers” in 1934. I'm hard-pressed to decide on a favorite version. My top three are from 1955, 1961, and 1986. The 1986 version stars a young Drew Barrymore and Keanu Reeves. Babes in Toyland features many of the classic fairy-tale characters such as Little Bo Peep, Gorgie Porgie, and Jack from Jack and Beanstalk complete with an evil villain and a happy holiday ending. Keanu Reeves and Drew Barrymore in Babes in Toyland. 2. Emmet Otter's Jug-Band Christmas – I've seen so many top Christmas movie lists, and only one had Emmet Otter's Jug-Band Christmas on their list. How is that even possible? This Jim Hensen Muppet-style Christmas musical is a family feel-good classic that, as far as I'm concerned, should be near the top of every holiday movie list! It is even narrated by Mr. Green himself, Kermit the Frog. This was the movie I'd wait for every year and beg my parents to PLEASE can I watch it?! If you haven't seen it, you can find it now on Amazon Prime and Vudu. Trust me, you'd have to be a total Scrooge not to love it. Jim Hensen’s Emmet Otter’s Jug-Band Christmas. 1. The Nutcracker – So here we are at my most favorite Christmas movie of all. “But Sierra! The Nutcracker isn't really a movie.” Yes, I know this. At least, this version isn't. Like many classics, there are several versions of the Nutcracker out there, and even a new one in the theaters this year. But my favorite version, and my all-time favorite thing to watch every Christmas is the American Ballet's “The Nutcracker” starring the insanely talented and incomparable Mikhail Baryshnikov. No one jumps like Misha! When VHS was at the top of technology, my mom, who instilled my fanatical love of all things Mikhail Baryshnikov, recorded a TV showing of “The Nutcracker”. Every year she and I would sit in the living room, bannishing my dad to silence in the rest of the house, and watch this beautiful ballet. To me, this is the epitome of Christmas “movie”. It has amazing music, a beautiful story full of magic and whimsy, drama, suspense, and of course the most wonderful happy ending. The American Ballet’s The Nutcracker starring ballet icon and legend, Mikhail Baryshnikov. The American Ballet premiered “The Nutcracker” in 1976, which was just a couple years after Baryshnikov defected from the Soviet Union. It has been half a century and still less than a handful of dancers have even come close to precision and height of jumps in ballet of Baryshnikov. Besides being a beautiful holiday ballet classic, it is truly an athletic performance beyond any gold medal, Heisman trophy, or world cup feat. Now that you know my favorite Christmas movies, what are yours?